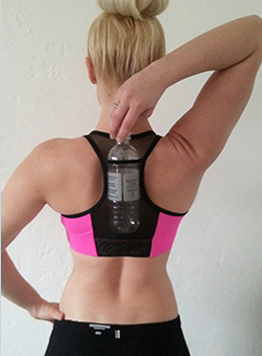 This sports bra has a mesh pocket built into the the bra and allows you to carry a standard 16.9 oz bottle of water on your back while working out. 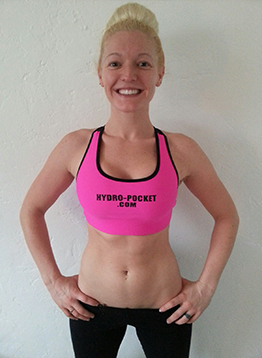 Front of the sports bra has website screened on the front, HYDRO-POCKET.COM. The sports bra is made with 92% Nylon and 8% Lycra material. The material is breathable , soft hand, comfortable, machine wash, and quick dry. The mesh pocket material is also 92% Nylon and 8% Lycra, same content as sports bra just a different weaving. The elastic band around the rib cage is 2 inches wide which gives you better support. Color available in Black. We are selling size Small, Medium, and Larges. If your tired of wearing a water belt, hydro-pack, or simply carrying your bottle water in your hand , this product is for you!!!! Product was Made in the U.S.A.